Sure, those are brilliant holes, but their brilliance has been well documented. Incidentally, my own favorite hole on the course is the 14th, the many virtues of which Andy Johnson has detailed for The Fried Egg. The par-4 2nd, by contrast, has received little sustained attention. It is an understated hole, straight and descending, draped across a gentle hillside and ending at a tightly bunkered green. A lesser architect would have flattened the side slope and built a dull par 4 on this land. Even MacKenzie might have been forgiven a boring hole to link the long ocean views of the 1st to the vivid uphill framing of the 3rd. But instead he made one of the finest long par 4s I’ve played. As with much of MacKenzie’s work, the 2nd is best studied from the green backwards. 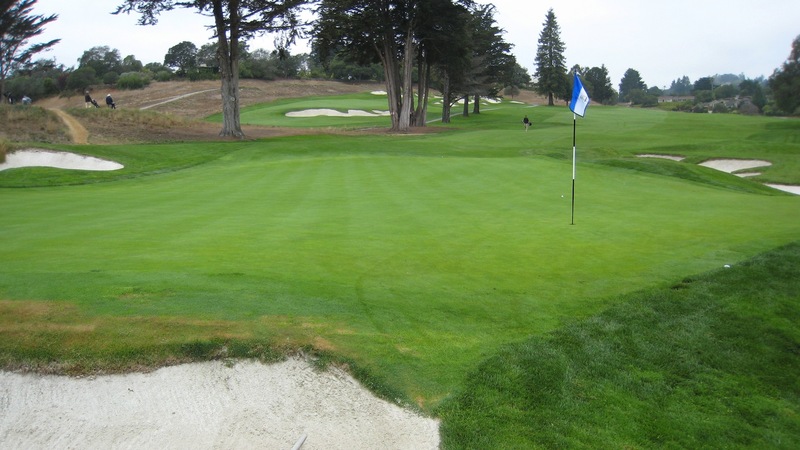 It is a quasi-Redan, set at a diagonal, tilted back, and guarded front left by a large bunker. The safe play is short right, where the contours feed a rolling ball away from the back right bunker and onto the putting surface. This feature will appeal to low-trajectory, low-spin players, who, with a precisely played shot, can use the ground to reach any pin position. Those who play the kind of high-trajectory, high-spin approaches rewarded by most modern golf courses, on the other hand, may have trouble here. To get close to a back pin, those players would need to attempt an uncomfortable carry over the bunker (and risk the devilish trap directly behind the green, which cannot be seen until you are in it). Front pins are an even trickier target for strong ball-strikers: if you come in with too much height and spin, you cannot take advantage of the contoured runway, and you landing zone will be very small and well defended. These deterrents to an aerial attack are a reminder that Pasatiempo rewards the adaptable player more than the one-dimensional bomber. Whereas other holes call for high, spinny approaches, the 2nd vexes those who can hit only high and spinny shots. But no matter the style of approach you choose, you will find your task easier from the right side of the fairway. From there, you will have a look at the whole green and an angle down its length. The left side of the fairway, however, offers an intimidating prospect. But–and this is where the method of MacKenzie’s design snaps into focus–the right side is tough to hit. First, the fairway slopes strongly to the left, so only a tee shot that flirts with the right-hand rough will stay up. Second, a bunker lies in wait 326 yards from the tips, guarding the Tiger line. Third, and most important, the right half of the fairway is not visible from the tee. In order to attain position A, you have to launch your drive into the unknown. The challenge of this tee shot is psychological. We mistrust what we can’t see. To will ourselves to launch a four-dollar ball blindly over the crest of the slope is difficult, even if we know it’s the correct play. After all, the left half of the fairway is just sitting there, wide and friendly… and visible. Why not just ease a three wood toward the left bunker? In that way, you can think yourself out of par on this hole. MacKenzie’s mind games are at the core of his greatness; he is perhaps the most psychologically sophisticated of all golf architects. 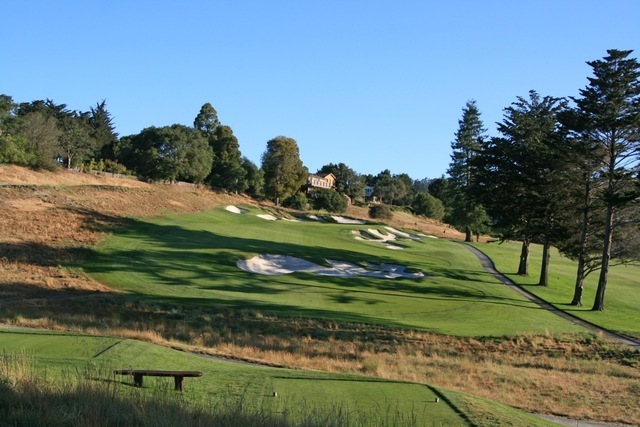 His courses tend to look more difficult than they actually are, and the 2nd at Pasatiempo is no exception. While the yardage on the card and half-hidden fairway are both imposing, the hole plays wider and more downhill than the view from the tee suggests. Awareness of the blind right-hand fairway bunker may deter stronger players from aiming for the most desirable position, but the slope will feed all but the biggest and most aggressive drives away from trouble. And the green itself, though plenty dangerous, has more room back left than can be seen from the fairway. So on this long par 4, a weak ball-striker who has smarts and guts, and who is not fazed by MacKenzie’s illusions, stands a good chance of besting a strong ball-striker who lacks mental fortitude. It is an ingenious hole but, like several at Pasatiempo, would be improved by some (unfortunately impossible) tree removal. The evergreen looming about 50 yards from the tee precludes what would be the boldest and most exciting drive–a draw shaped onto the right edge of the fairway. As it is, either a fade or a pinpoint straight ball is required. Surely this restriction was not part of MacKenzie’s plan for the hole, but, as I suspect Tom Doak was reminded during his restoration efforts in the mid-aughts, there are multimillion-dollar mansions on the other side of that evergreen. 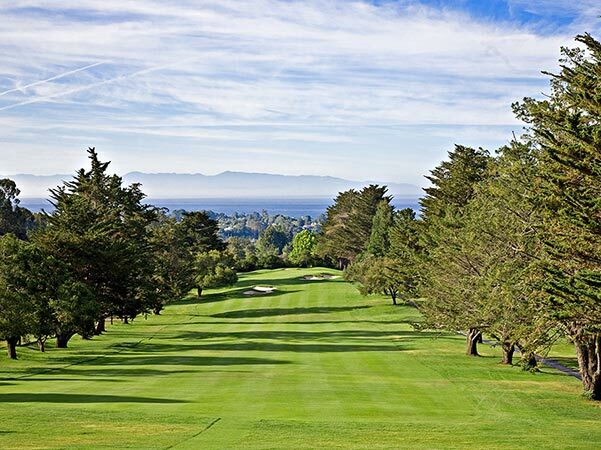 As a well-known course surrounded by homes and open to the public nearly every day, Pasatiempo Golf Club has to make compromises. The spacious corridors and stunning vistas of Alister MacKenzie’s original design, captured poignantly by Julian P. Graham’s camera in 1929, will never return. But what remains is a layout of supreme integrity and subtlety. Go play it sometime. Well thought-out piece here. Your ability to dive into just one hole is impressive. I enjoy the 2nd at Pasa a lot. While there are a few factors that hold Pasa back from being one of my ultimate favorites, there’s no disputing the many subtleties and design features that make it a true gem.